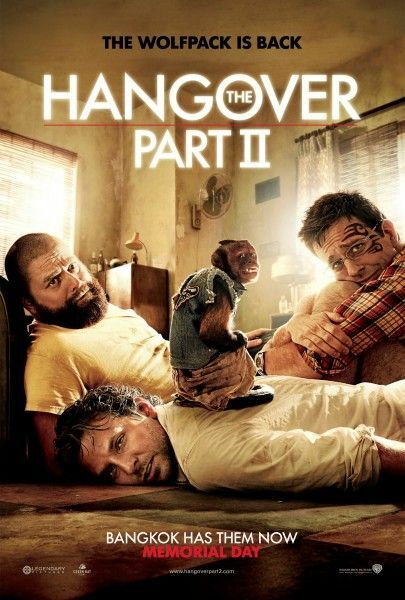 Warner Bros. has sent us the teaser poster for The Hangover: Part II. When I went to go see Sucker Punch last week, they showed the teaser trailer and the audience ate it up. People are ready for more shenanigans and as we all know, shenanigans are made funnier by the presence of a monkey that’s dressed like a person. Hit the jump to check out the poster. Also in poster news, check out the promo poster for The Twilight Saga: Breaking Dawn – Part 1 and the teaser poster for Harry Potter and the Deathly Hallows – Part 2. Directed by Todd Phillips, The Hangover: Part II stars Bradley Cooper, Ed Helms, Zach Galifianakis, Jeffrey Tambor, Mike Tyson, Justin Bartha, and Ken Jeong. It opens May 26th.